Questions have been mounting as to where Finance Minister Paschal Donohoe is in the midst of this summer’s vulture fund sell off. PRESSURE IS MOUNTING on government to act to protect homeowners who have found themselves sold to vulture funds in recent weeks. Fianna Fáil Spokesperson on Finance Michael McGrath said the silence from Finance Minister Paschal Donohoe on the sale of thousands of mortgage holders this August is “deafening”. McGrath called on the minister to declare what position he will adopt on the sale by Permanent TSB of 7,400 family home mortgages to Start Mortgages, owned by US vulture fund Lone Star. The minister also faces calls to clarify when he was formally consulted about the sale of the controversial Project Glas loan portfolio. What did Paschal Donohoe know and when? “We need to hear from Minister Paschal Donohoe in terms of what he knew – it seems a little bit suspicious that we had such large-scale sales in the month of August when we don’t have the opportunity to hold Minister Donohoe to account in the Dáil,” said Fianna Fáil’s Transport spokesperson Robert Troy today. He said the minister must clarify what he knew and when he knew it. “We must remember that in particular with PTSB the State does own 75%… there is an obligation to refer matters to the minister. We need to know what he knew and if he gave the okay,” added Troy. Questions have also been raised in recent weeks about the type of mortgage-holders who find themselves sold to vulture funds. The bank and government narrative is it is only “non-performing” loans that are sold in the bundle. However, politicians are questioning such statements, with both Troy and Fianna Fáil Senator Lorraine Clifford Lee stating that their constituency offices have been inundated with calls from people who are not in arrears, yet have found their bank has sold on their loans. “If Pascal does see fit to come out and make a statement and enlighten us… we are told so many times that they are non-performing mortgages, but certainly my phone has been hopping with constituents who are coming into my office who are performing mortgage holders, and yet still their mortgages have been sold to the vulture funds,” said Troy. Clifford Lee added that she too has taken calls from constituents who are not in arrears, never were in arrears, who do not have any linked mortgages in arrears, yet have had their mortgages sold on by PTSB to the vulture fund. “They are absolutely baffled, there are people in that bundle and they should be taken out and the minister really needs to make comment on those people,” she said. Fianna Fáil were adding their voices to calls from Donohoe’s own Cabinet colleague, Transport Minister Shane Ross, who in an interview with TheJournal.ie, said he thought it was a cynical move by the bank to make the sale when the Dáil was in recess. He also said the relationship between a State-owned bank and the government needs to be looked at, adding that the government must have more of a say in large-scale loan book sales of this type. While the Finance Minister is nowhere to be seen on the matter, it was his junior minister Michael D’Arcy who was on the airwaves today to explain the government’s position on the recent mortgage sell off. When the allegation of the government “washing their hands” of the vulture fund sales was put to him on RTE’s Morning Ireland, D’Arcy said the government cannot act, even in banks in which it is the largest shareholder. We own some of the banks but we don’t run the banks… we are not in a position to do what some people say we should do. 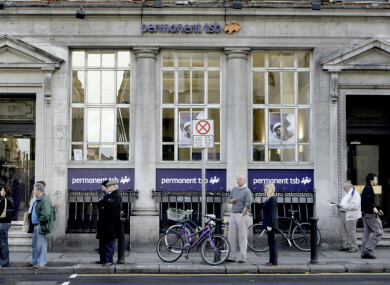 McGrath said that under the Relationship Framework Agreement in place governing the State’s 75% shareholding in Permanent TSB, Minister Donohoe would have been consulted on this proposed loan sale. “He will have the opportunity to express a view on the part of government and to suggest changes to the loan sale. The bank will then make the final decision,” he said. The minister has presented himself as a bystander in this whole process and “conveniently doesn’t point out that the bank either has already or will formally ask him for his opinion”, added McGrath. “The silence from the minister and the government is no longer sustainable. We know for a fact that 1,050 fully performing family home mortgages are in the portfolio lined up for sale,” added the Fianna Fáil finance spokesperson. Critics of the government who state it isn’t doing enough are “wrong”, said Minister D’Arcy, who said it has accepted Michael McGrath’s legislation which sets out to regulate vulture funds, as well as accepting Minister Kevin Boxer Moran’s Keeping People in Their Homes legislation, which ensures that judges are bound to consider the consequences of home repossession on an individuals circumstances. While D’Arcy said that customer rights are not “diluted” when sold to a vulture fund. He said the same protections which borrowers enjoyed prior to the sale of their loan do not change after the loan is sold. When it was put to him that customers may find themselves in “changed circumstances” when they find themselves sold to a vulture fund. Minister D’arcy said it was it was “possible and even likely in some cases”. The Department of Finance has stated that is has assurances from Start Mortgages that deals made with PTSB will be honoured. Previously, the minister stated that he is “conscious” that some customers that have restructured their mortgages with their bank may need to engage with the new lender. The government said it is supporting the Private Members Bill put down by McGrath requiring the regulation of loan owners. It is expected the final stage of the Bill will be taken after the summer recess. Email “'We own some of the banks, but we don't run the banks': Minister says government can't stop vulture fund sales”. Feedback on “'We own some of the banks, but we don't run the banks': Minister says government can't stop vulture fund sales”.